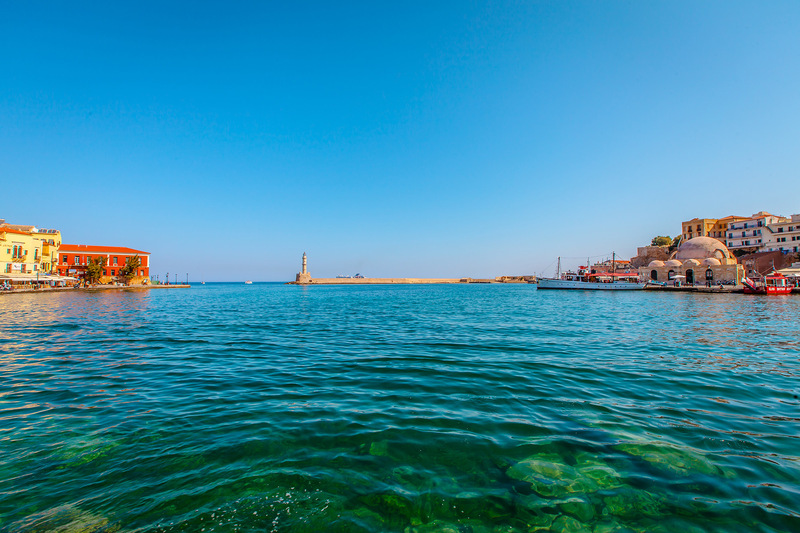 Chania was a Minoan-age (2600-1600 BC) settlement known as Kydonia, the Greek word for quince (which is a sort of large, yellow, misshapen, pear-like fruit). Its population (90,000 metro area) is about half that of the capital, Heraklion. This city towards the western end of Crete is in the greenest region of the island. Some artifacts from excavations in Chania's Old Town of Minoan, Classical Greek, Hellenistic and Roman-era Kydonia can be found in the Chania Archeological Museum, interestingly housed in the 15th-century former Venetian Monastery of St. Francis. A brand-new museum is under construction. After the disaster of the Minoan Eruption (1600 BC), when the 120-km distant island of Santorini blew up, causing a tsunami which wiped out the Minoans, Kydonia rebuilt and remained a prominent city for many centuries. 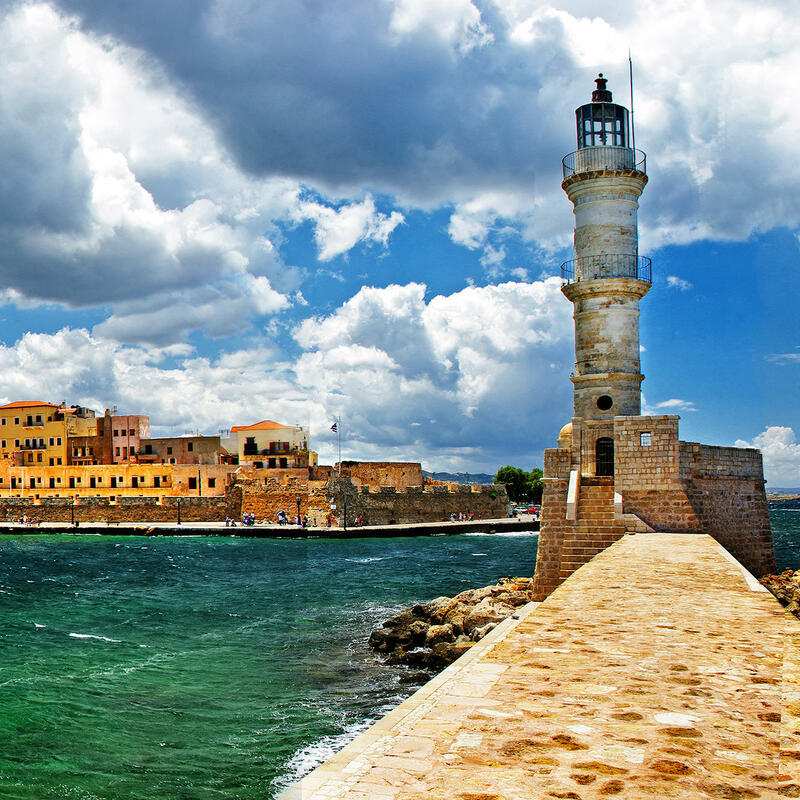 With its Venetian harbor, narrow, maze-like streets, Venetian mansions, fountains, Byzantine Churches, harbor-side lighthouse, fortress, and mosque, this is one of Greece's most interesting and picturesque cities, and Crete's most beautiful. Despite its size and importance, it has dodged much of the modern resort movement that has been going on in Crete the last few decades, retaining a great deal of its original character. Kydonia was mostly Byzantine-held during the First Millennium, with ownership shifting to the Arabs for a short period. The Venetians bought the city in the early 1200's, fortified it, and stayed for 400 years. During Arab rule Kydonia was re-named Al Hanin (the Inn), which was Greek-ified to Chania after the Byzantines re-took the city in 961 AD. Compared to the rest of Greece, the Ottomans ran things for a relatively short 180 years, before Crete and Greece regained their independence and were reunited after a few decades of Cretan semi-autonomy. During this time Chania was the capital of the island. It remained Crete's capital until 1972. 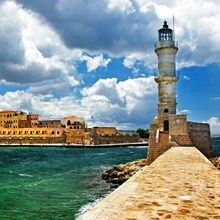 Chania consists of an older inner core, the Old Town, surrounded by the relatively recent construction of its New Town. Old Town, demarcated from the New Town by a system of Venetian walls and moats,is an interesting mixture of Venetian and Ottoman architecture. Restored Venetian mansions line parts of the waterfront, with the surrounding mountains rising in the distance behind the city. Parts of the old Venetian walls survive. The harbor, shaped like a fat boomerang and divided into eastern and western halves, is bordered by cafes and restaurants where you can sit and enjoy a meal or a coffee and take in the passing parade of tourists and locals. The Venetian-built Firca Fortress is on the west side the harbor mouth. The Byzantine and Maritime museums are on the fortress's grounds. The maritime museum has paintings and ship models, navigational instruments, and a Venetian-era scale model of Chania. The Jewish Quarter is off the western harbor, and its spiritual heart is the newly renovated Etz Hayyim synagogue, a tiny building on a brick-paved street with a Greek flag flying over the front door. The only missing ingredients in this historical building are...Jews, all of whom were taken from Crete by German Nazis, none of whom returned. This restoration was the work of one man, historian Nikos Stavroulakis, who was determined to save the memory of the over 2,000-year presence of Jews on Crete. Northeast of the Jewish Quarter is the Topana district. Topana is the Turkish word for cannon, named for the gun emplacements on the Firka Fortress. Southeast of the Firka Fortress, 250 meters across the waters of the western harbor, stands the Mosque of the Janissaries. Janissaries were the elite troops of the Sultan's household. They were also the personal guards of Turkish administrators. The mosque is now used for various exhibitions. The tall, thin Venetian lighthouse, which stands at the eastern side of the harbor mouth, 150 meters opposite the Fortress, is visible from any spot on the harbor. It is especially beautiful when lit up at night, its stone work taking on a rich yellow hue. Walking eastward around to eastern side of the harbor, you come to the large masonry sheds of the Venetian-era Great Arsenal, long buildings joined by common side walls. These were the Venetian shipyards. Built around 1600, there used to be 17 of these buildings; 5 remain. The restored buildings now house the Center For Mediterranean Architecture, and exhibits are held there. There is a small ferry which takes people almost due north across the eastern harbor to the Fortezza, a fortification on the same neck of land, or key, the lighthouse is on. This 125 meter trip save a 700-meter walk around the harbor to get to the same place, which is ideal for sunsets. Moving around the eastern harbor takes you to the modern marina. Inland from here is the Turkish Quarter, called the Splantzia. This eastern third of Old Town is its the largest quarter. This is where excavations of Minoan Kydonia has been taking place since 1964 by a team of Swedish and Greek archeologists. It has proved a rich source of artifacts, many of which are now housed in the Chania Archeological Museum. Included are a couple of clay tablets from 1450 and 1300 BC. Splantzia is a warren of narrow street, fascinating little houses tucked away here and there, and a great place to just wander around. Like most of the rest of Old Town, many of its streets are cobble-paved, and some of them are less than a meter wide. The Venetian (Catholic) Church of St. Nicholas on 1821 Square (1821 being the year Greece declared its independence from the Ottoman Turks) was converted into the main mosque of the city during the Ottoman years and still has a minaret to prove it. It is the heart of the Splantzia district. The church was part of the Dominican Monastery of St. Nicholas dating from 1320. 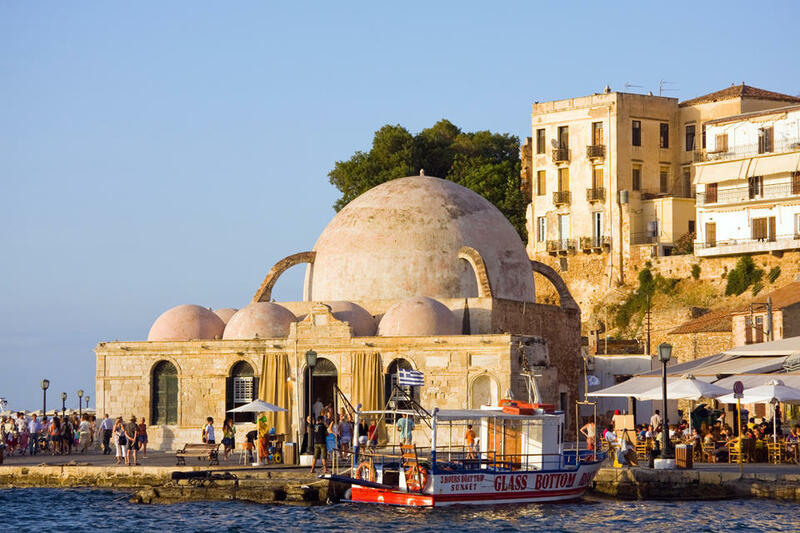 About 500 meters inland from the center of the harbor is the huge, cruciform-shaped Demotiki Agora, or Municipal Market, right on the border between the Old and New Town. It is a copy of the market of Marseilles, France. Eleftherias Venizelos, Chania native and one of Greece's greatest prime ministers, inaugurated it in 1911 as part of the ceremony formalizing Crete's reunification with Greece. It has fish stalls, fresh fruit, vegetables and meat, and interesting little restaurants which are for the workers at the market but serve excellent, fresh meals (look where the restaurants are) to anybody who cares to sit down and order. There are bakeries with their delightful odors, and small shops selling all manner of things- olive oil, herbs, spices and soap, among other things. Not far from the Market is "Leather Street," where leather goods of all kinds- sandals, shoes, bags, etc. can be bought or made to order for good prices. Just beyond the Demotiki Agora is Chania's New Town. Much of New Town is apartment blocks, and life is noticeably louder and faster-paced. If you get up on the old western walls of the city, back of the Jewish Quarter, you can have a fairly good panorama of both Old and New Towns. The old Venetian moat encircling the Old Town is gradually being restored. The KTEL bus station (for busses running to other cities and villages) is in New Town. There are a number of large hotels in New Town, as Old Town is just a few minutes' walk away, and the rooms are usually cheaper. New Town features the Municipal Gardens (Demotiki Kypoi), which were built by a 19th century Turkish ruler. There is a duck pond, and wild Cretan goats (the famous kri-kri. By the way, "Kri-Kri" is a well-known brand of goat's cheese found in supermarkets all over Greece.). There are peacocks, a cafe, an outdoor cinema, and a Turkish Clock tower. About a kilometer southeast of Old Town, you'll find Halepa, the upper class neighborhood where the father of Eleftherios Venizelos built a home for his family in 1870. In the same area is the Polytechnic University, and the residence of the former High Commissioner of Crete, Prince George. New Town also has a lot of bars, clubs and night spots for the many young people of the city, and young visitors from other countries. Most of the beaches close to Chania are west of the city. In order of distance, heading west, these are the beaches you'll find. None are more than 15 kilometers from Chania. Note: The first 3 beaches are really extensions of the same beach stretching west from Chania. Nea Chora- less than 1 km. Within walking distance, Nea Chora gets crowded for that reason. Just west of the Venetian walls, this beach is sandy, with safe, shallow water. 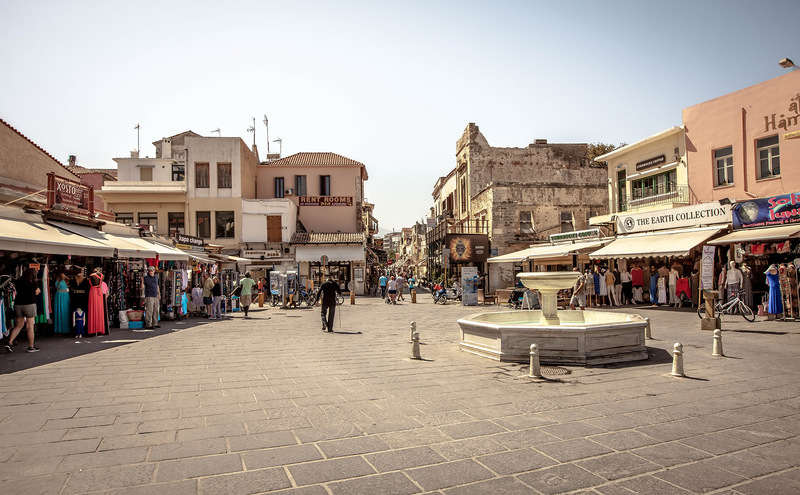 Well-organized, with beds, umbrellas, cafes, and tavernas. There's another beach east of the Venetian walls, i.e. closer in to the city, which is not as popular due to high winds. Golden Beach- 1 km. Next to Nea Chora, also within walking distance. Called Chryssi Akti in Greek, it's named for the beautiful color of the sand. Also with safe, shallow waters. There is a kids playground, and the usual umbrellas and sun beds. Germaniko Pouli- 2 km. Again, within walking distance if you're ambitious. Otherwise it's served by local busses. A nice, large, clean beach, it's well-organized, and has nearby hotels, apartments, and even camping. There are also tavernas close by. Agioi Apostoloi- 4.5 km. Separated by a cockscomb-shaped group of 3 headlands from the first 3 beaches, Ag. Apostoloi is still close enough to the city to be very popular, although it's a bit quieter. Somewhat protected by the headlands, wind is seldom a problem here. Well-organized, with sun beds, umbrellas, and water sports. Again, it has safe, shallow waters. There are lots of places to stay nearby, and a good choice of tavernas and beach bars. Kalamaki- 7 km. Located between the seaside villages of Agioi Apostoloi and Kato Galatas, Kalamaki offers a large pleasant resort, a nice sandy beach and clean blue waters. An organized beach, this popular spot has plenty of accommodations, bars and tavernas. Winds can be a factor during the high season. Stalos- 8 km. Just beyond Kalamaki, the beach of the village of Stalos is long and offers golden sand and transparent water. The nearby towns of Platanias and Agia Marina are lively places for partying after the sun goes down. Beach offers a variety of water sports, and a nice view of the islet Agioi Theodoroi just a kilometer off the coast. Agia Marina- 9 km. Exactly opposite Agioi Theodoroi island, Agia Marina is a well-organized beach with every tourist amenity you can think of. There are nearby campgrounds to this organized beach, and lots of night life in the nearby villages. Platanias- 11 km. This highly developed, cosmopolitan beach is in a highly developed area for tourism. Offers many options for water sports, bars, restaurants, and cafes. You can rent jet skis, banana boats, or snorkeling equipment. There are a number of small coves, and the beach varies from sand to mixed sand and pebbles. Souda- 7 km. At the western end of long, narrow Souda Bay, Souda Beach is the closest beach to Chania, going east. The port at Souda now serves as Chania's main port, and is also a NATO naval base. It's a nice, organized beach with the usual umbrellas, sun beds, and fish taverns. Souda makes a nice place to base day trips to the surrounding areas from. Loutraki- 12 km. Loutraki is near the eastern end of the Akrotiri peninsula. This southeastern-facing beach offers complete protection from the summer meltemi winds which blow in from the north, moderating summer temps in the Aegean. It is not an organized beach, and food and other amenities can be found in the nearby village of Marathi. Marathi- 13 km. Close to the village which bears its name, this is a nice, well-organized, family-friendly beach with amenities like cafes, tavernas, restaurants, and a few hotels close by. Samaria Gorge, longest of its kind in Europe, is just 20 km south of Chania. This wild, topographically fascinating place is a mostly downhill walk to the south shore of Crete from the gorge's beginnings 16 kilometers to the north. The White Mountains (Lefki Ori) are perfect for alpine-style hiking, so bring your walking sticks. The ancient city of Aptera is about 13 km east of Chania, a kilometer inland from Souda Bay. It was a chief Cretan city during the Minoan years, on up through the Hellenistic times (300 BC and later). Aptera means "wingless." Mythology has a contest taking place her between the Sirens and the Muses, which the Muses won. The Sirens subsequently lost their feathers from the wings on their shoulders. The famous pink sands of Elafonissi are about an hour's drive west of Chania, at the western end of Crete. 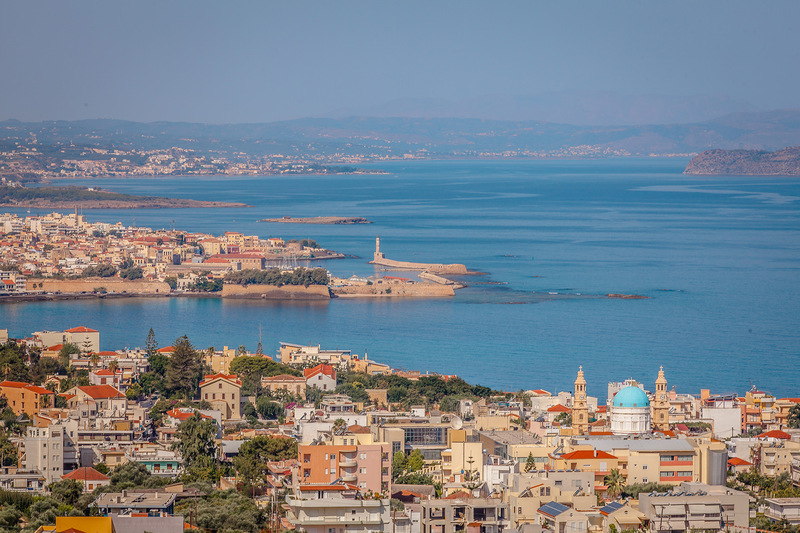 As you can see, there's a lot to do and see in and around Chania, all of which makes for an unforgettable visit.